Government House, where Governors-General and Viceroys ruled India as though they were Emperors. Built by Lord Wellesley, in 1803, the land cost £71,000, the structure cost £87,000 and the furnishings cost £18,000. It was based on Kedleston Hall, three miles north-west of Derby, the home of the Curzons who later provided one of the most illustrious Viceroys. At Kedleston there are two projecting wings, the other two were never finished, Government House was given all four. Every succeeding incumbent made some addition to the building. (1) It is now called Raj Bhavan and is used by the Governor of Bengal. It remains almost unchanged. An old postcard of Government House, from the south-east. Raj Bhavan from the north-east at dawn, 1979. Main entrance to Raj Bhavan from the north, 1979. Kedleston Hall, three miles north-west of Derby, and the home of the Curzon family. Built 1759 - 1789. Regarded as one of Robert Adam's finest works. Designed by the Tory Curzons (who would later supply India with an eminent Victorian Viceroy) as a defiant gesture to the Whig Cavendishes of Chatsworth House. 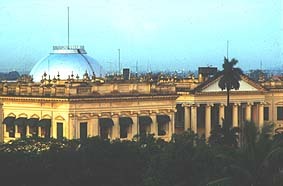 The plans of the house had been published and it became the model for Government House, Calcutta. (1) 'Calcutta', Geoffrey Moorhouse, Weidenfeld and Nicholson, 1971.